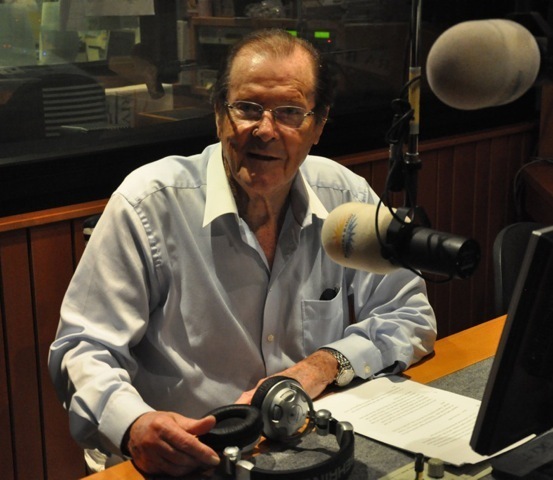 When my wife and I set out to make a children's recording that tells the stories of violin makers Nicolò Amati and Antonio Stradivari, we knew who we wanted to narrate: Sir Roger Moore. He is best known as James Bond, but he is also a marvelous narrator. He is 86 years old and an exquisite storyteller. Years ago, I met him while playing in the Rachlin festival in Dubrovnik, where he was narrating Peter and the Wolf. I am a member of the Bavarian Radio Symphony Orchestra, but was performing at the festival with the BR Chamber Orchestra. He had agreed to record the narration for our projects, Amati’s Dream and Stradivari’s Gift, which combine story, violin-playing and orchestra. So last August my wife and I traveled to Monaco to record Sir Roger Moore. In a world where children are experiencing rapid advancements in technology -- TV, apps, e-books as well as fast-paced films -- we wished to take them back in time and draw them into a world that moved at a slower pace, but was equally exciting. Both stories take the listener on a journey to 17th-century Italy and the violin shops of Nicolo Amati and Antonio Stradivari. The characters of the violin shop, and their dreams, portray the love involved in creating a violin. The music is the magic carpet for transporting the emotions of the tale. The pieces played alongside the story range from the lyric to the virtuosic. Amati’s Dream and Stradivari’s Gift are for narrator, solo violin, and string orchestra, but we’ve performed them often with a pianist or guitar duo playing the orchestral reduction. My wife, author and composer Kim Maerkl, wrote the stories and composed the music to feature the violin, performed by me. (You can purchase the music here.) We have been performing the pieces in Germany for 10 years in family and children’s concerts. This year we launched our new record label, Atlantic Crossing Records, and are releasing the pieces as CDs and sheet music. When we have performed these pieces, often we have invited a violin maker to set up a small violin shop at the back of the hall or on stage. The luthier would display tools, molds and violins in different stages of completion, as well as different sizes of violins, which the children could try after the concert. Sometimes the violin maker would give a short presentation with a question-and-answer session afterwards. We were amazed at the level of interest and curiosity the audience exhibited for string instruments. I hope Amati’s Dream, and Stradivari’s Gift will inspire children to further explore classical music. Musical platforms are evolving, but I believe there will always be a way to touch the hearts of listeners with the violin. We will be forever grateful to Roger Moore for the poetry and magic he has brought to our recordings Amati’s Dream and Stradivari’s Gift. I know the books are intended for children, but they seem so wonderful with Sir Roger Moore as a narrator, beautiful illustrations and great music that I am more than tempted to get a copy for myself! I bet they would be pretty pleasant to listen to for a road trip or train commute. Go for it!